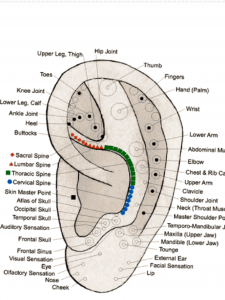 Auricular acupuncture is the stimulation of acupuncture points on the external ear surface for the diagnosis and treatment of health conditions in other areas of the body. The ear holds a microsystem of the body, consistent with the brain map discoveries of Canadian neuroscientist Wilder Penfield. Dr. Penfield found that maps of the body exist on the surface, or sensory cortex, of the brain. This same brain map is also projected onto different areas of the body, “microsystems”, and in particular precision, onto the ear. Practitioners all over the world use this therapy to treat pain, dysfunction, addictions and internal disorders with excellent results. Whether used in conjunction with another treatment or by itself, auriculotherapy is often effective when other treatments have failed. Best of all, it is safe, non-invasive and has no known side effects. One of the great advantages of learning auriculotherapy is the various ways you can use ear therapy to achieve great results. You can use acupuncture needles, e-stim and press tags. However, what’s really exciting is that there are many tools out in the market today that allows an acupuncturist to use auriculotherapy on a patient without the use of needles. The benefits of this is quite exciting. One is that it enhances the effect of your treatment, but beyond this beneﬁt, auriculotherapy also offers the practitioner other advantages including better patient recruiting and retention, broader scope of practice, and enhanced ﬁnancial rewards. Another benefit is your practice now attracts those patients that have always wanted to try acupuncture but may have been somewhat needle phobic, thus opening up your practice to many many more potential patients.